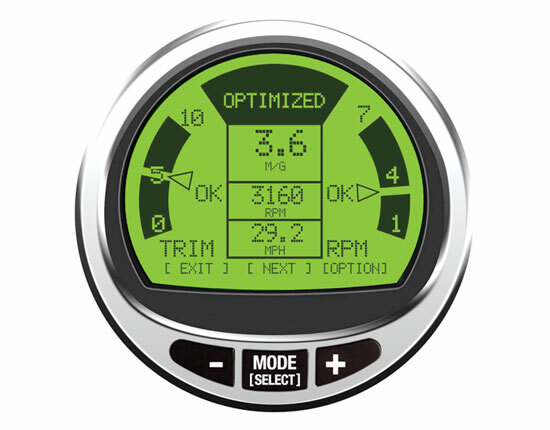 Continuous product improvement earns the big Yamaha V8 a new model designation. 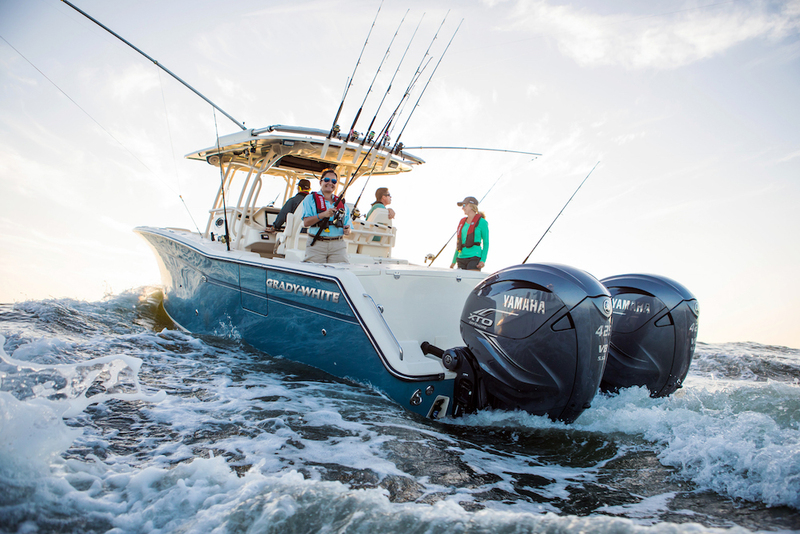 Citing its commitment to continuous product improvement, Yamaha Marine has introduced an F350C version of its big V8 F350 outboard first introduced in 2007. The “C” designation denotes a third generation of the motor with a number of incremental changes Yamaha has incorporated in recent years, including improved gearcase lubricity and corrosion resistance, reduced weight, and the extension of the standard warranty to five years. Wrap it all up in new cowl graphics and you’ve got the F350C, which we tested and captured on film in this First Look Video. The Yamaha F350 was introduced as a locomotive of an outboard, a torque-monster 5.3-liter V8 swinging a 16.25-inch diameter prop with the authority required to push the 11,000-pound 11’ 7” wide Grady-White Express 330 up onto plane or over a barn-high swell. A pair of F350 motors was portrayed as a light-weight, space-saving alternative to inboard engines on boats that were simply too heavy for any other outboard engines available at the time. With F350 outboards on the transom, there was suddenly a big empty space where an engine room used to be–room for fish boxes or an aft cabin. In the ensuing decade applications for the F350 have broadened; a single V8 Yamaha is replacing twin 200 HP motors on many center console boats, for example, and even powering mega-pontoons. 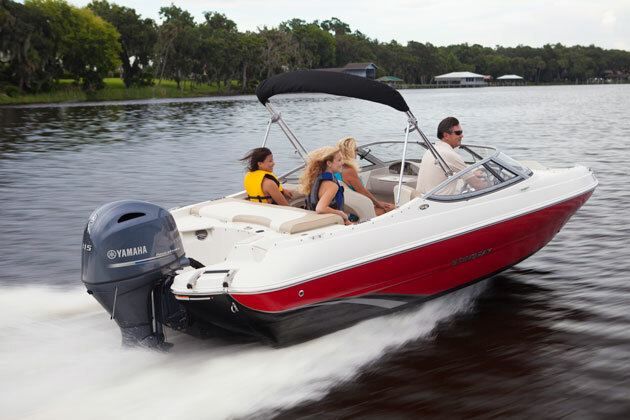 And the population of larger outboard-powered boats has grown significantly, according to Yamaha, which reports that sales of boats over 35 feet have increased 31 percent since 2007. 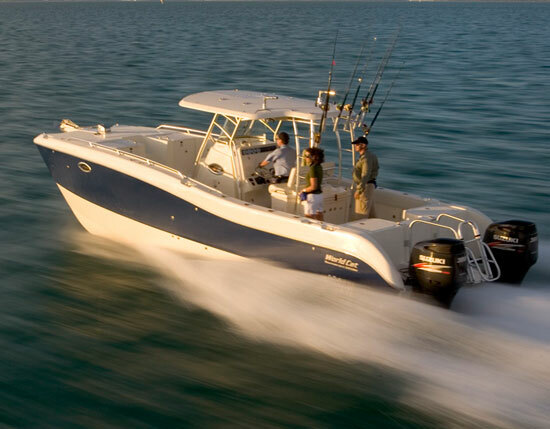 The Mercury Verado 350 can match the horsepower rating of the F350C, but only the exotic 6.2-liter V8 Seven Marine 557/627 can top the displacement of the big Yamaha in the outboard category. 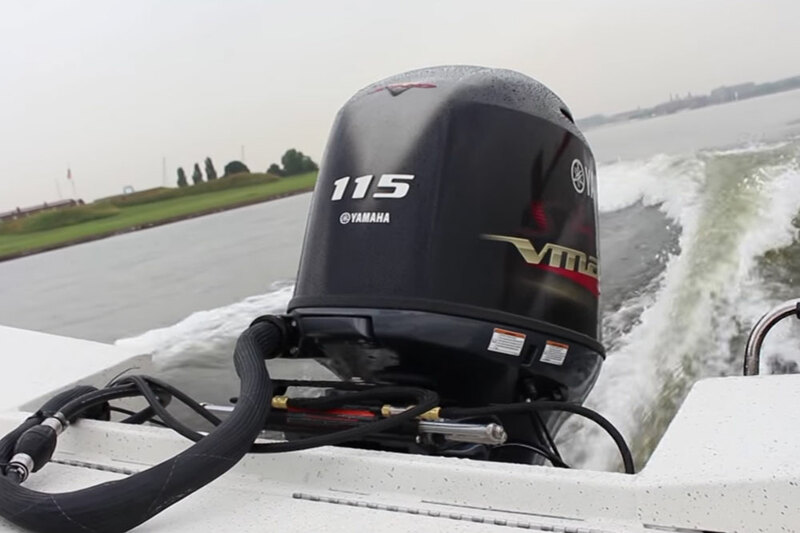 Yamaha stresses that its normally-aspirated V8, aided by variable intake valve timing, produces exactly the torque curve ideal for pushing a heavy boat–rising smoothly and quickly off idle and staying fat in the mid-range. It’s that power that gets translated into thrust through a prop with lots of blade area. Mercury can squeeze up to 400 HP from its Verado platform, but relies on a supercharger to blow power into a 2.6-liter six-cylinder powerhead and a 5800 to 6400 WOT RPM range to produce peak horsepower. It’s worth noting that the Verado platform was originally designed to produce at most 275 HP. 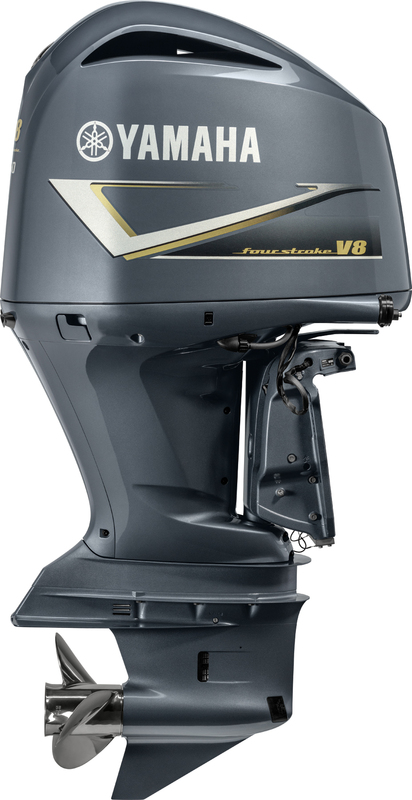 It’s also worth noting that a Verado can swing a 16-inch diameter prop, and I have never been disappointed in the supercharged thrust produced by a Verado, even on a heavy boat like the Boston Whaler 370 Outrage, which we ran with a Verado 350. 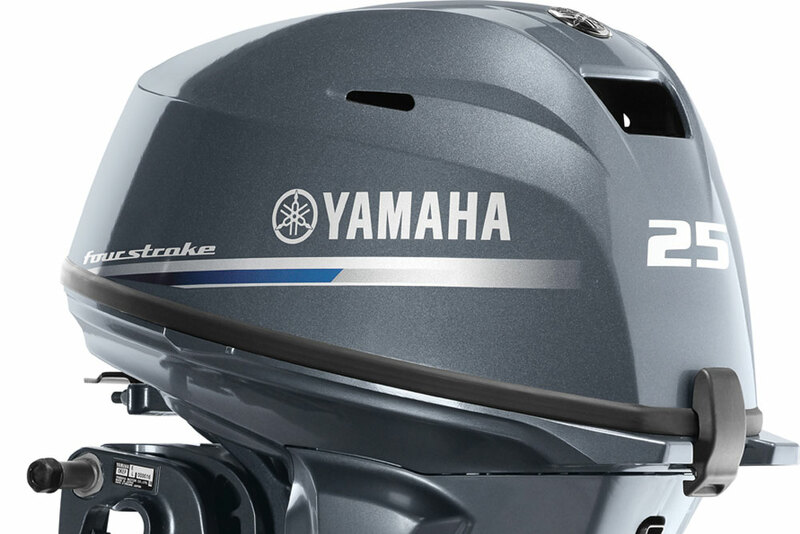 A new gold V on the cowl graphic identifies the Yamaha F350C. Yamaha claims the F350 is the better tool for the job of moving a heavy boat, and it’s been honing that tool over the years. The changes to the gearcase entailed revising internal passages to provide a better pathway for lubricant to gears and bearings, which are under a lot of load in this motor. Corrosion resistance was improved below the waterline when the motor is at rest, through the use of improved metal treatments. The F350C weighs 763 pounds, or about 41 pounds less than the original, 804-pound F350 (but still almost 100 pounds more than a 668-pound Verado 350). Much of that weight reduction is due to a revised exhaust manifold, but Yamaha has also shaved ounces here and there through the use of composites and the redesign of other components. 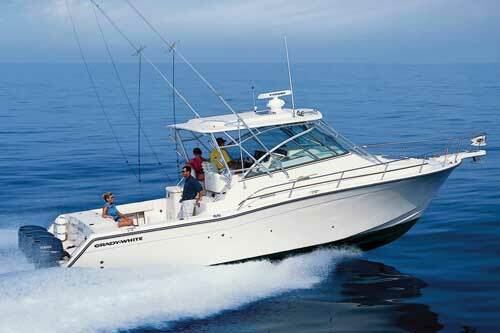 That weight reduction may not affect performance or economy at all on big boats, but it can’t hurt. The F350C is fitted with an ECU (Engine Control Unit) that monitors time of use in specific RPM bands and then gives the owner an alert when regularly-scheduled service is due. The ECU specifically clocks the time the motor spends between 3500 and 4200 RPM to address an issue with the flywheel design of the F350. A few years after the F350 was introduced it was discovered that a “harmonic event” takes place within the engine between 3500 and 4200 RPM that over time could cause the flywheel to fracture, leading to major engine damage. With no apparent fix for this issue short of redesigning the engine, Yamaha has a policy of simply replacing the flywheel after the engine has run for 80 hours within that 3500-to-4200 window, and set up the new ECU to count those hours. Note that this interval is not for 80 total hours of operation, rather only the hours in that RPM range, which is likely below the best cruising range for most boats. 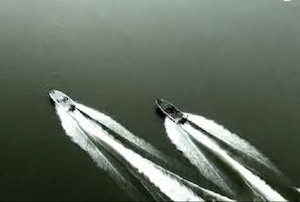 The performance of each boat will determine how much time the motor spends in this state of harmonic dissonance. This ECU has been retrofitted to earlier F350 models at no charge for a few years, and Yamaha also picks up the cost of replacing the flywheel. Perhaps to boost consumer confidence, Yamaha has also extended the base warranty of the F350C from three years to five years, with an additional two years of coverage available at extra cost. We recently sampled the F350C in Baltimore Harbor on a Shearwater 26 Carolina, a delightful 25’ 8” center console that weighed about 5,000 pounds with power and fuel. The power of the F350C came on smooth and deliberate, lifting us smartly out of the hole. But then the big V8 showed some legs, pushing the Shearwater to a top speed of 60.8 MPH while swinging a Turbo Offshore 14.25 x 19 prop. Best fuel economy was also impressive–2.59 MPG at 4000 RPM and 37.5 MPH. The smooth, quite operation of this motor is always impressive, and it’s essentially silent at trolling speed. 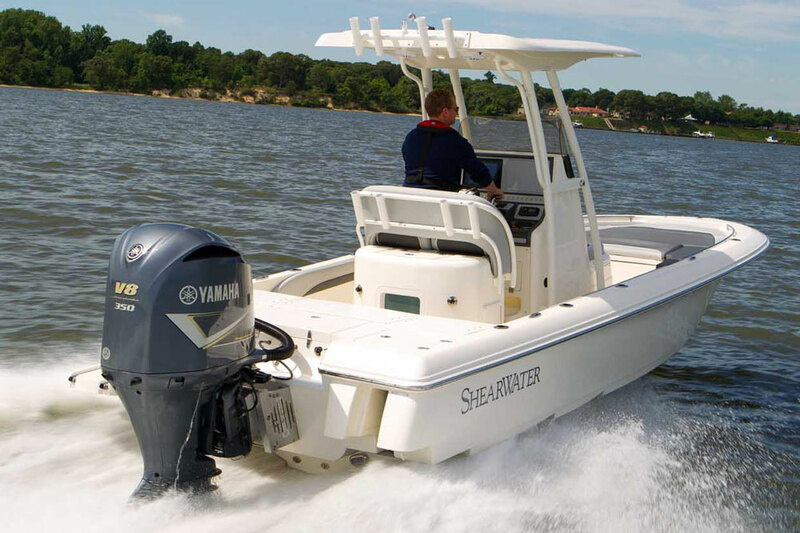 A single Yamaha F350C pushed a Shearwater 26 Carolina to over 60 MPH. Ten years after its introduction, the Yamaha F350C is still a good idea.